Collections - Graffiti - Page 1 - Stoneware & Co.
Graffiti, the artistic creation of renowned Kentucky artist David Mahoney, uses free-flowing brush strokes to create a sense of modern art in motion. As playful as it is artful, this pattern makes a beautifully dramatic statement in any décor. A simple green-and-white color scheme reinforces the overall look of contemporary sophistication. 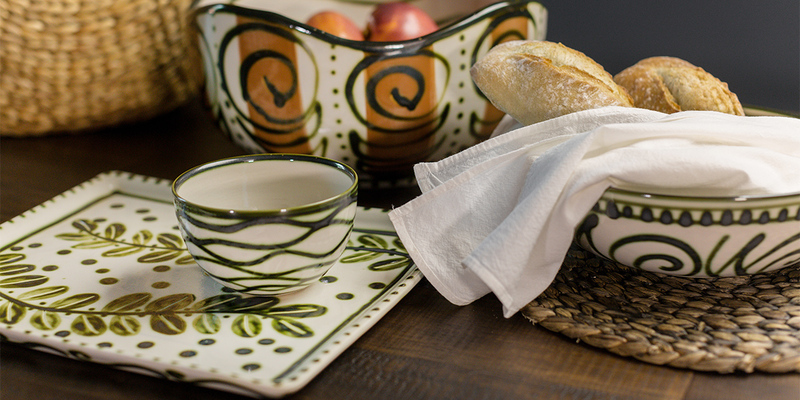 Christy Lee Brown understood the importance of infusing new designs and style into Stoneware’s portfolio, her collaboration with renowned Kentucky artist David Mahoney created several new patterns including Augusta, Flora and Graffiti. All distinctly familiar, but each with a different hand-painted depiction of nature.